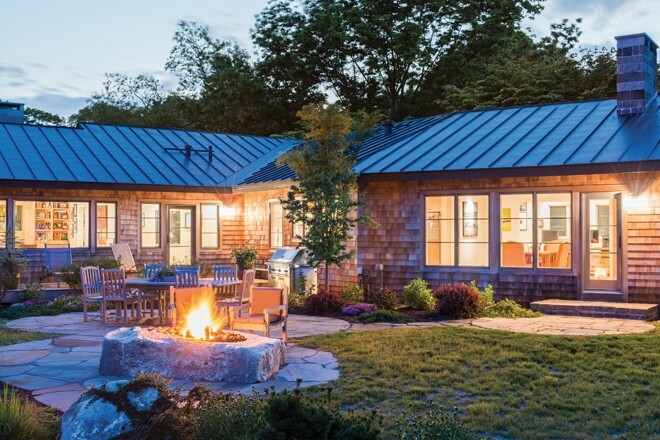 Thanks to the renovation, Thomas’s 1950s ranch has a fir front door, red cedar shingles, and a standing-seam metal roof. 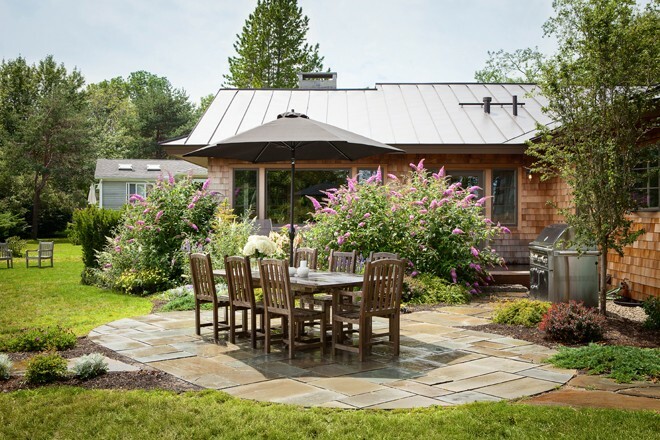 The front garden includes a stainless-steel sculpture by Stephen Porter of Searsmont. 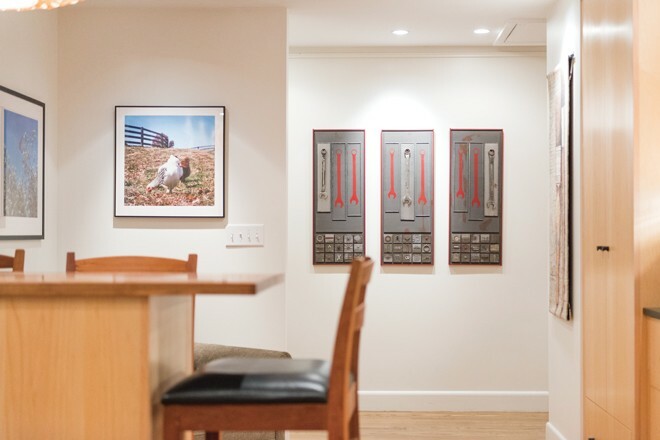 A view of the kitchen shows a photograph by Thomas’s son Sean to the left and, in the background, a Louise Philbrick triptych that makes use of Thomas’s grandfather’s wrenches. The multimedia piece hangs together at the moment, but the sections are designed so they can be separated and given to each of Thomas’s three sons in the future. A view from the kitchen to the dining room. 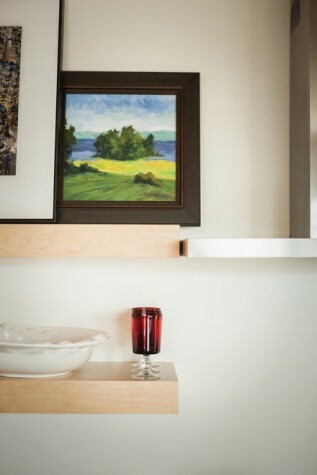 The simple maple cabinets and open shelving were built by Derek Preble of Derek Preble Cabinetmakers in Biddeford. The high breakfast table is topped in walnut and surrounded by Thos. Moser chairs. 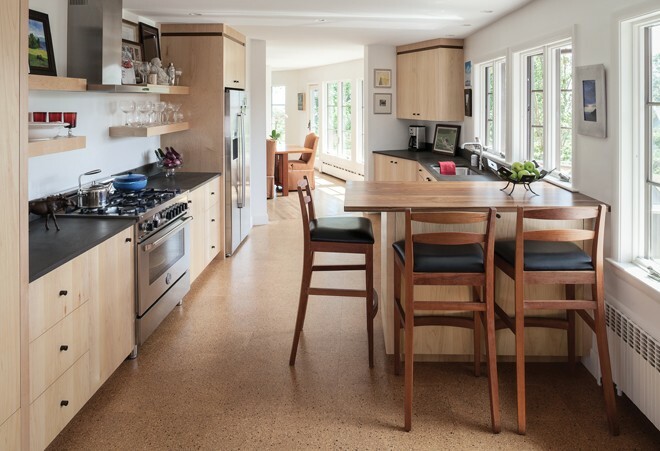 The floor is cork, and the countertops are PaperStone. To the right, between the two windows, is a painting of a night view by Colin Barclay. 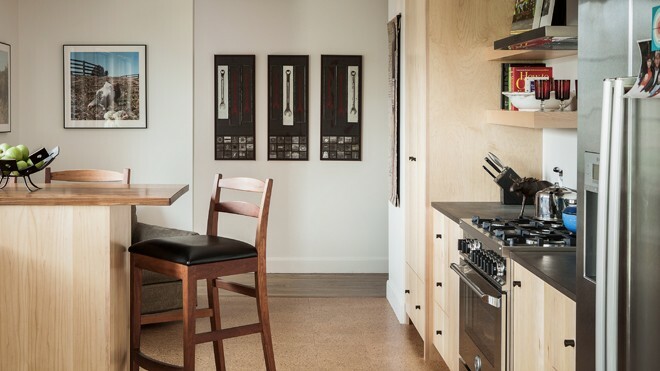 Derek Preble crafted the kitchen’s open shelving. The landscape painting is by artist Anthony D’Alessandro. 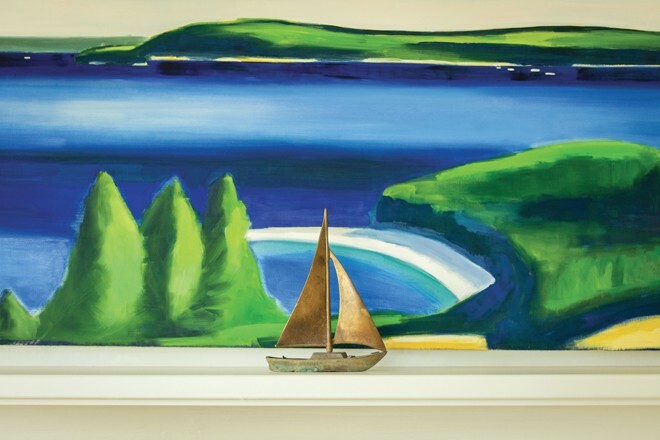 One of the first artworks that Kevin Thomas acquired was a Connie Hayes painting of a blue road, much like this painting on the dining room wall. The table was custom made by John Czajkowski of the Cabinet Shop in Yarmouth. 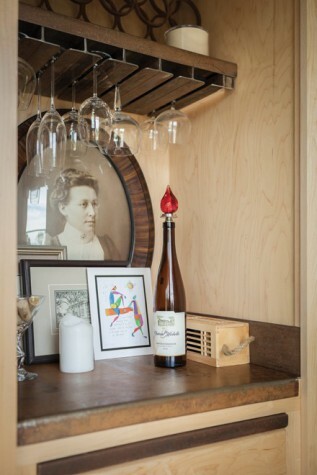 A closet between the dining room and living room eventually became a bar fabricated of metal and maple by Nate Deyesso of DSO Creative Fabrication. The photo is of Aunt Katie, the woman who raised his grandmother. 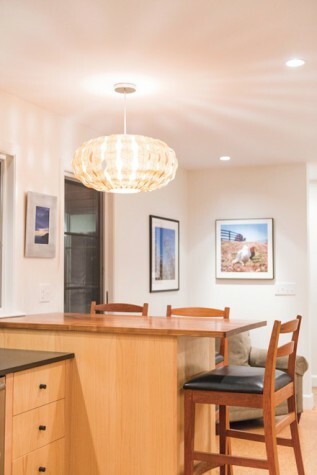 A downstairs hall that leads to the dining room features a Thos. Moser bench, above which hangs a Mary Bourke painting called Three Paint Cans. To the right is a landscape by Michael Marks. In the dining room beyond, there is an encaustic by Shoshanna White. 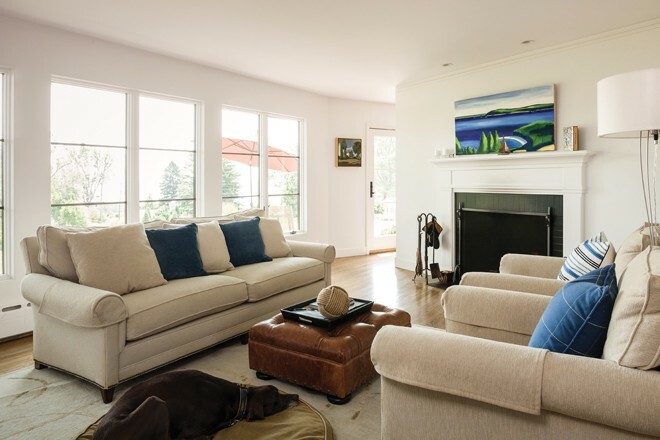 A piece by artist Thomas Connolly hangs over the fireplace in the living room off the master bedroom. 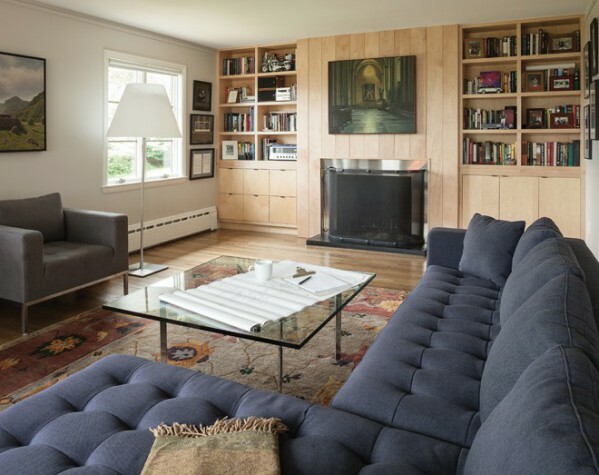 The painting to the left is by David Vickery and the Karastan rug is from Mougalian Rugs. 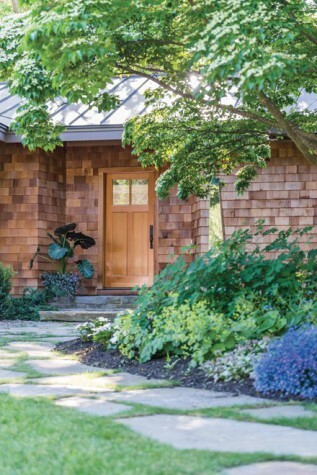 A maple paneled wall in the master bedroom. The platform bed of steel and toasted oak was made by Derek Preble. The print of a girl riding a bike is by Bo Bartlett. 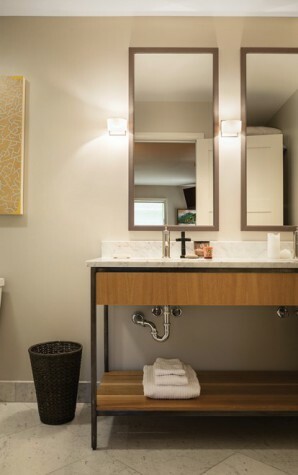 A bathroom vanity of steel and limed oak was also made by Derek Preble. The floors and countertop are of Carrara marble. 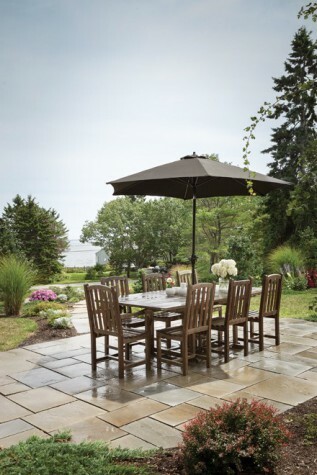 A bluestone patio with Asia West furniture is situated so diners can appreciate the garden that lines the ridge of the property as well as the Atlantic beyond. 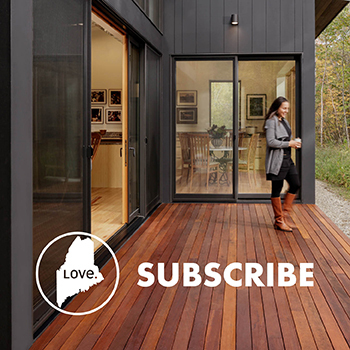 Kevin Thomas’s backyard with an evening view of the master suite’s living area and the dining room. All of the landscaping is by Ted Carter of Ted Carter Inspired Landscapes in Buxton. Carter designed “the fire rock,” which is a piece of Washington Valley Stone in which sits a gas fire ring that can be operated with an automatic timer.